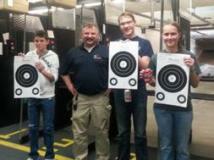 This just for teens class is designed to give teenagers the knowledge, skills and attitude to understand firearm safety and practice it under the supervision of our expert instructors. Students spend approximately one hour in the class room going over firearm safety and operation. Once they have mastered the safety and handling skills in the classroom, we go over to the range where they will have the opportunity to shoot a semi auto pistol and revolver under the expert supervision and coaching of our instructors. We provide everything the student needs for this class. Paper, pens, guns, ammo, targets and the good time. Cost is $29.95 per student and is limited to six students per class.